This was my last day in Galway. Tomorrow, I’m off to Dublin for my final week of vacation. So, today I wanted to get to the last few places I’d been putting off. My first stop was across the street at the Galway City Museum. It being a Saturday morning, it was pretty crowded, and I only managed a couple of pictures that actually turned out. 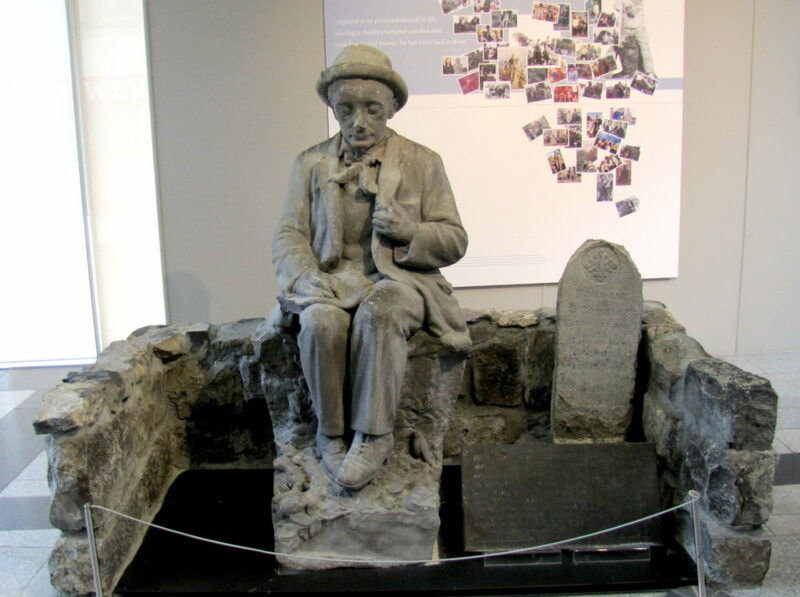 This is a statue of Pádraic Ó Conaire, a poet of Galway from the early 20th century. It used to sit in Eyre Square, but it was subject to repeated vandalism, culminating in a decapitation, so it was moved to the museum. There were a number of the early sketches for the statue on display, and they looked nothing like the finished statue. Pádraic was on a pedestal, in an impressively serious pose, but apparently they finally settled on something that depicted more of what people remembered of him around Galway – sitting awkwardly on a stone wall, his bow tie very loosely knotted, his hat on back to front, looking adorably goofy. I love this statue, and I love the evolution that brought it to the final result. I don’t know what was up with the vandalism and decapitation, though. There was a replica of a Galway Hooker1 that had been built for the museum, and hung from the ceiling fully rigged. There was a lot of stuff about the early days of Galway, and about the 1916 Uprising, and the War for Independence. There was also a fair bit of science stuff about the sea. This was my favourite display. 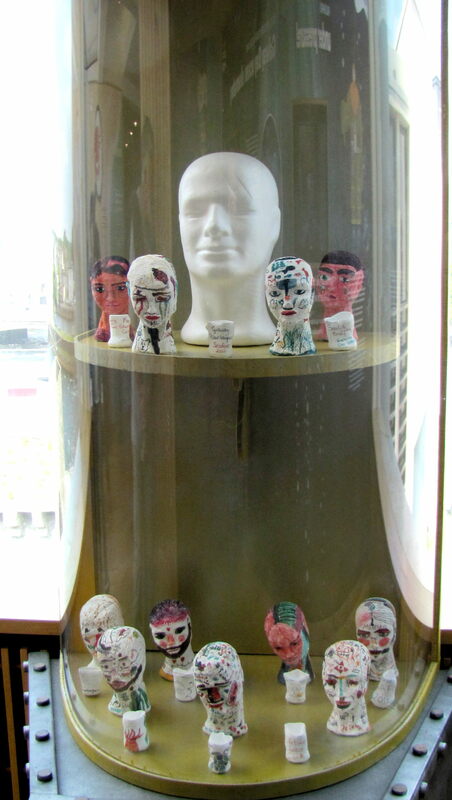 It was a bunch of Styrofoam heads and cups. The heads started at the size of the white one, then kids coloured them, and they were lowered into the sea, and compressed by the pressure of the depth. There was even a little video showing it happen. After the museum, I walked along the river down to the Galway Cathedral. 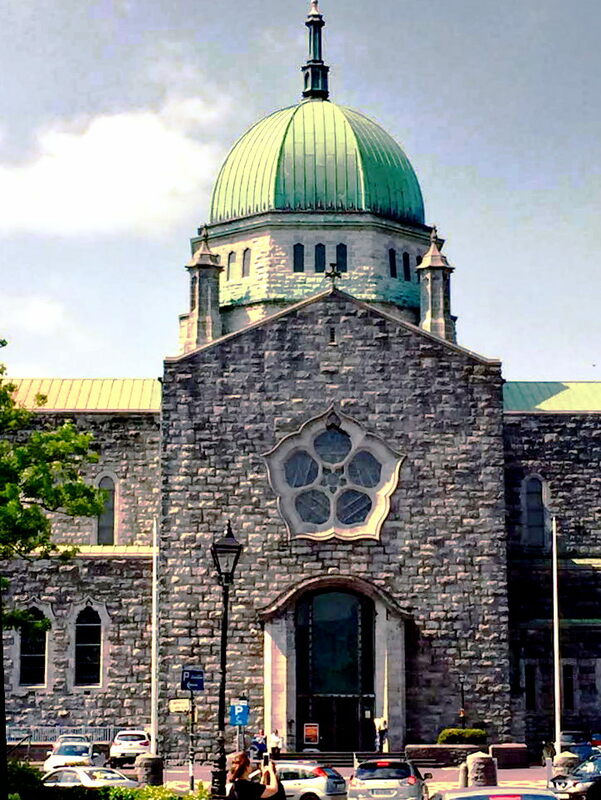 The Galway Cathedral is actually The Cathedral of Our Lady Assumed into Heaven and St Nicholas, but that’s too long to say every time. I stuck my head inside, and it was absolutely gorgeous. But there were First Communion services going on, so I didn’t linger to take pictures. You can see some pictures of the interior here. I walked back to St. Nicholas Collegiate Church, at that point. 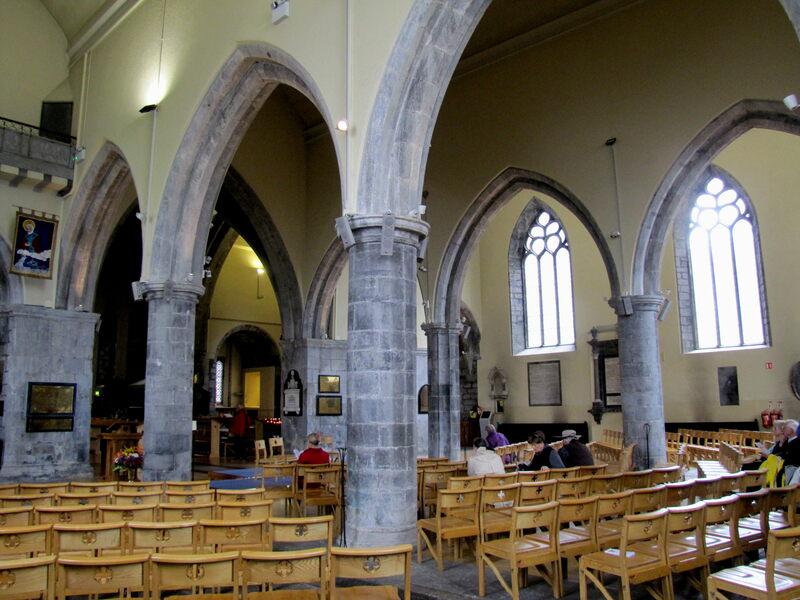 St. Nicholas is the oldest still-standing building in Galway. I didn’t get a picture of the outside, because it was surrounded by the street market that was going on with the Galway Early Music Festival2. 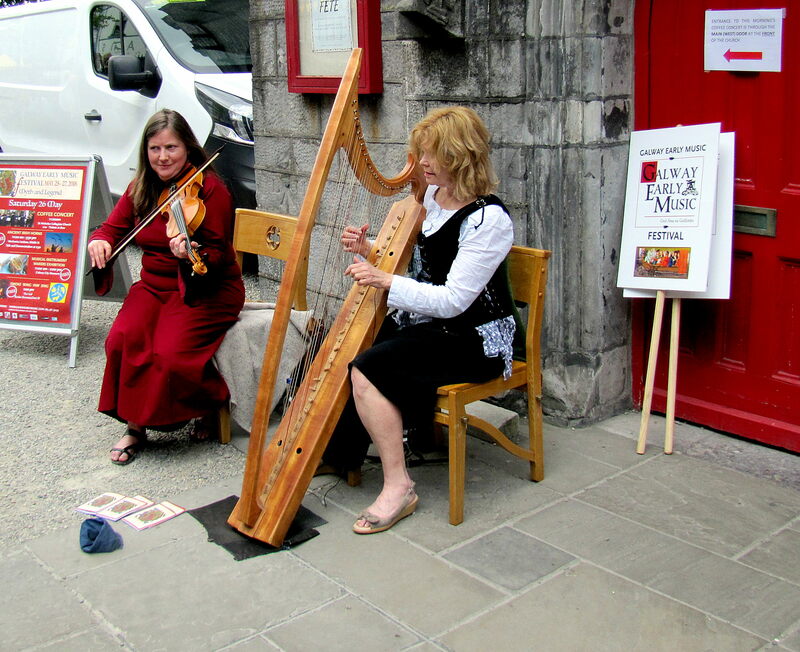 Outside the door of St. Nicholas, there were a couple of ladies playing harp and fiddle. They were doing Si Bheag Si Mhor, and it was beautiful. This is the inside of St. Nicholas. They’re setting up for the concert tonight. I had a nice chat with a fellow named Andrew, who I am pretty sure was the vicar, and a nice look around. I love those columns. 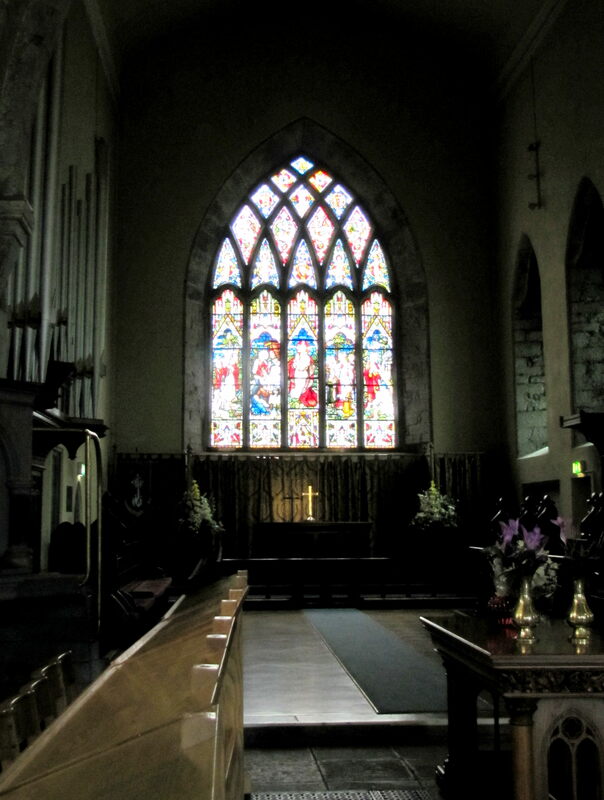 The stained glass window of St. Nicholas. 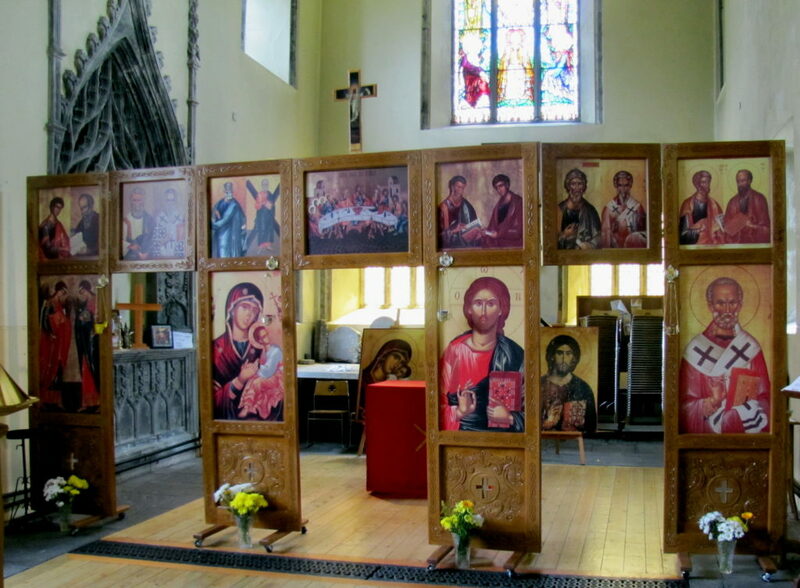 At the back of one of the church wings is this screen with icon-like paintings that I thought were very lovely. So, looking around the street market, I found out that there was a concert this afternoon at the Chapel of the Poor Clares – one of the Early Music Festival’s presentations of medieval ballads and madrigals. I made my way down to Nun’s Island, where the Poor Clares have their abbey, and managed to get a ticket, though it was pretty packed. A wonderful concert, by Simone Sorini Syrenarum. Now, I’m back at the flat, finishing up this post and getting ready to leave tomorrow morning. I’m glad I took the time here in Galway to relax, and I think I’m going to miss the city. But I’m really looking forward to Dublin, too. I leave for Ireland in 0 days.